Enjoy a great meal, watch a game, chat with the locals and drink!! 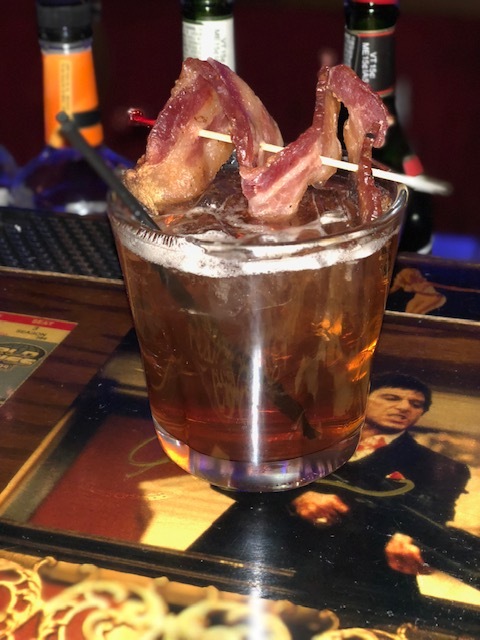 Located in Edison Park, Mecca Supper Club is a purveyor of great food & drinks influenced from the North Woods of Wisconsin. 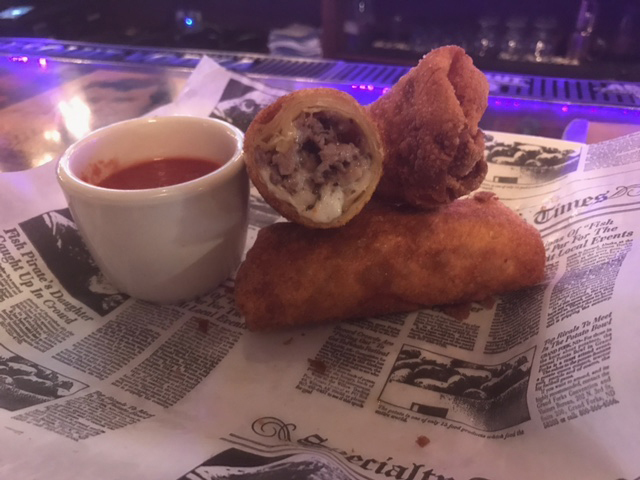 Mecca Supper Club is a long time resident of Edison Park....Come enjoy a drink and a great meal in a comfortable & friendly environment. Our staff is friendly, tvs are plentifuly, drinks are strong and the food is fantastic! The Mecca is not your typical northwest side establishment.. Come check us out!!! Daily specials give you an opportunity to enjoy a great meal at a low cost....Whether you are looking to watch a game and grab a sandwich or enjoy a nice dinner while gathering with friends and family, we are the place to go.....The Mecca Supper Club can scratch all of your itches....COME EAT!!! Add Grilled Chicken, Fried Chicken, Salmon or Skirt Steak to any salad!!! Stuffed w/ our famous candied bacon & melted cheddar cheese. Served w/ sour cream. Add BBQ Chicken! Beef Tenderloin, Mushrooms, Green Peppers & Onions skewered and grilled. Topped w/ a Gorgonzola sauce. Lightly breaded & fried until golden. Served w/ Siracha Aioli. 3 mini tenderloin sandwiches w/ horseradish sauce & garlic herb mushrooms on toasted buns. 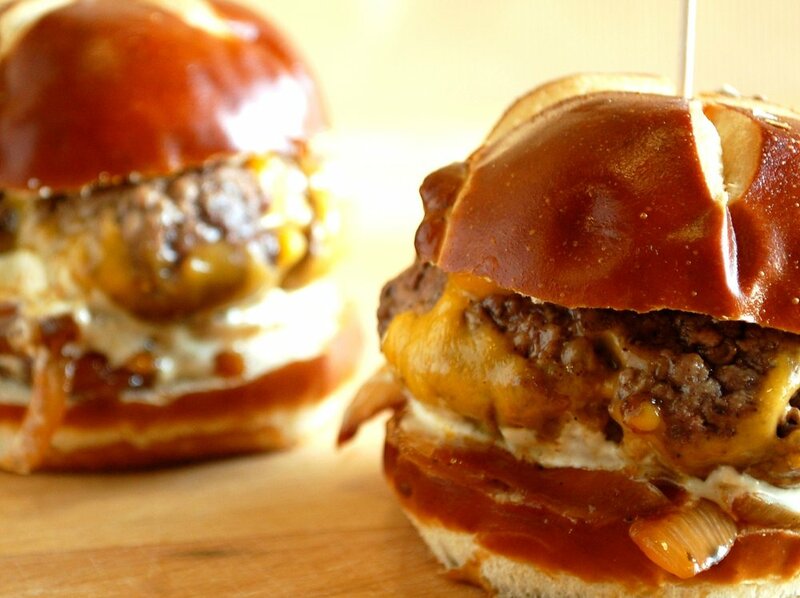 4 mini Burgers topped w/ Cheddar Cheese & Beer Onions served on pretzel buns. Toasted Texas Toast piled high on Texas Toast with w/ our world famous candied bacon, lettuce, tomatoes & mayo. Marble Rye piled high w/ tender corned beef, Swiss cheese, saurkraut & house made 1000 Island dressing. Blackened Salmon, lettuce, tomato & Ranch wrapped up in a Multi Grain tortilla. Shaved thin & served on a hoagie roll w/ melted mozzarella, fried onions & a side of au jus. A 10 oz hand packed sirloin patty served on toasted marble rye w/ beer onions, American cheese & Bistro sauce. A 10 oz hand packed sirloin patty served on a pretzel bun with mac & cheese and candied bacon. 2 5oz Patty's cooked to perfection on the flat top. 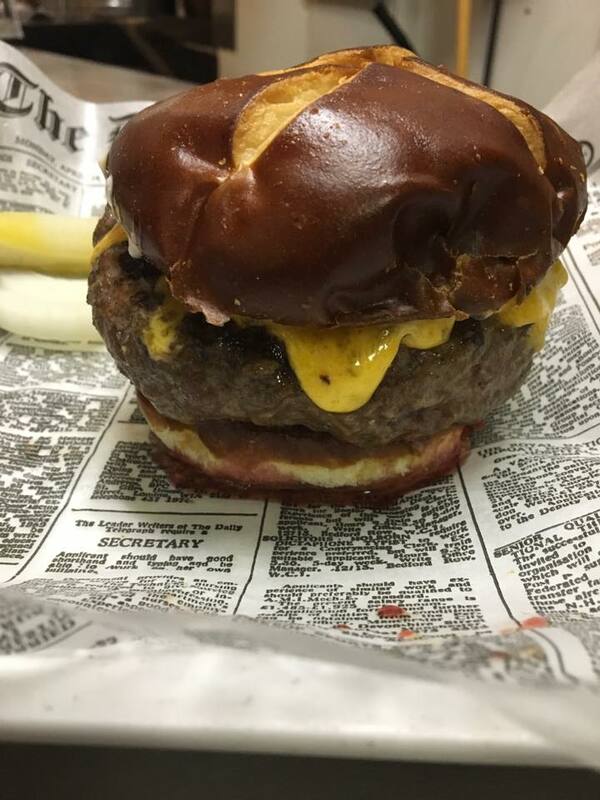 Served on a Pretzel Bun w/ Garlic Mayo, Pickles & American Cheese. Served on Texas Toast w/ a fried egg, Siracha BBQ Sauce & fried onions. 8oz Chicken Breast served on a Pretzel Bun w/ Candied Bacon, Romaine Lettuce, Tomatoes & Mayo. A tender 8oz cut steak grilled to your liking & topped w/ Cajun Garlic Butter. Served w/ house cut Curly Fries. 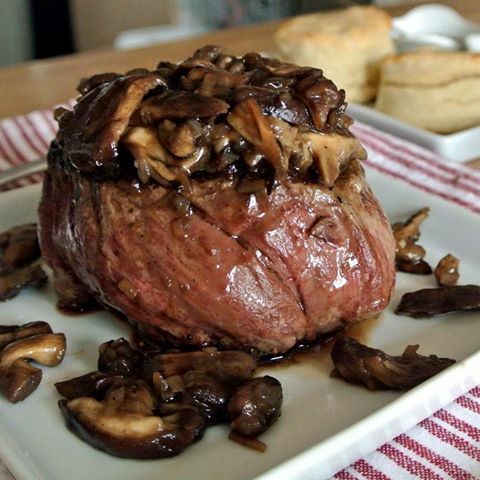 8oz Filet cooked to the temperature of your choice & topped w/ sauteed garlic herb mushrooms. Tenderloin skewered w/ onions, mushrooms & peppers. Topped w/ a Gorgonzola sauce. Choose broiled or lightly breaded and fried. Served w/ house made tartar sauce. Hand breaded filets, lightly breaded & fried to a golden brown. Served w/ house made tartar sauce. Our delicious house made Meatloaf served w/ Mashed Potatoes & Mushroom Gravy. Hand breaded & served w/ house made cocktail sauce. 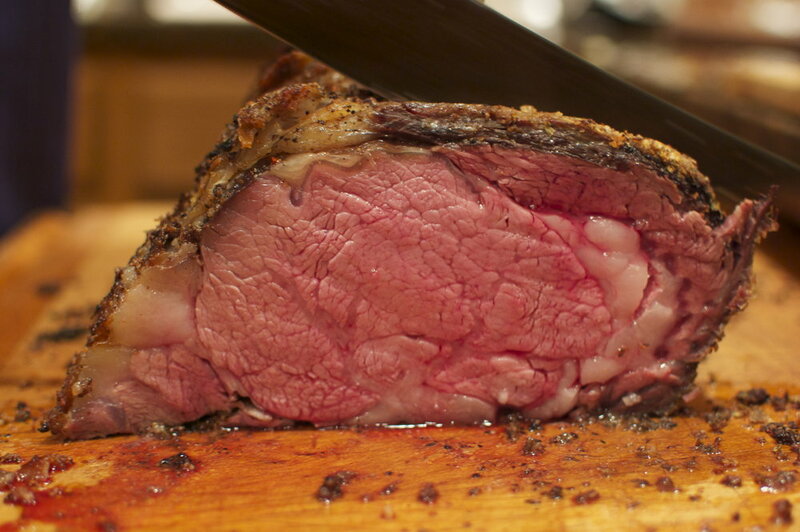 Broiled w/ garlic herb butter. Served w/ house made tartar sauce. Choose regular or Siracha BBQ sauce. Served over Linguine w/ melted mozzarella cheese. ***Any Pizza can be made Gluten free!!! Call 773.775.1077 from 11a – 2a daily. Reservations strongly encouraged for parties of 4 or more. MONDAY: $5 Burger w/ Fries. 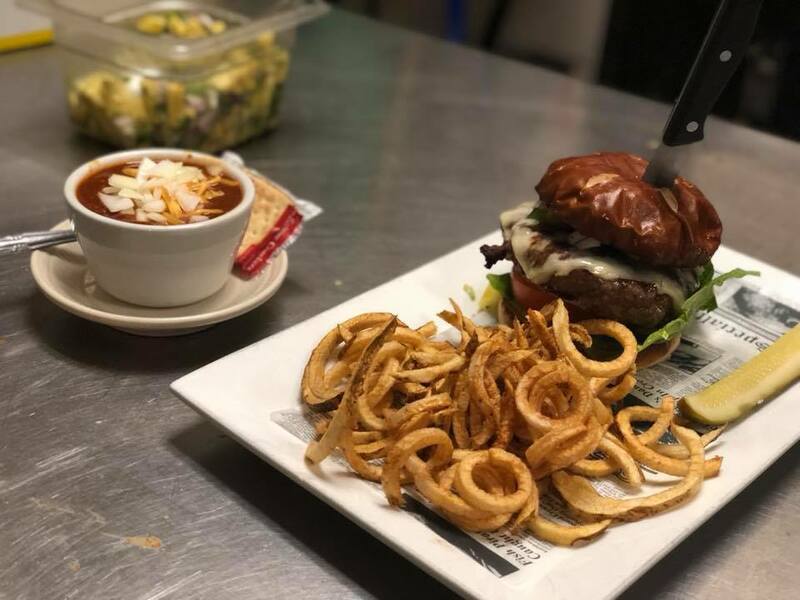 A 10 oz hand packed Sirloin patty on a pretzel bun with lettuce, tomato, onion, pickle & fresh cut fries. Cheese, etc are available for an additional charge. KIDS EAT FREE!!! THURSDAY: $10 Burger & a Beer. KIDS EAT FREE!!! WEDNESDAY: $2 Hamm's & $3 shots of Malort! 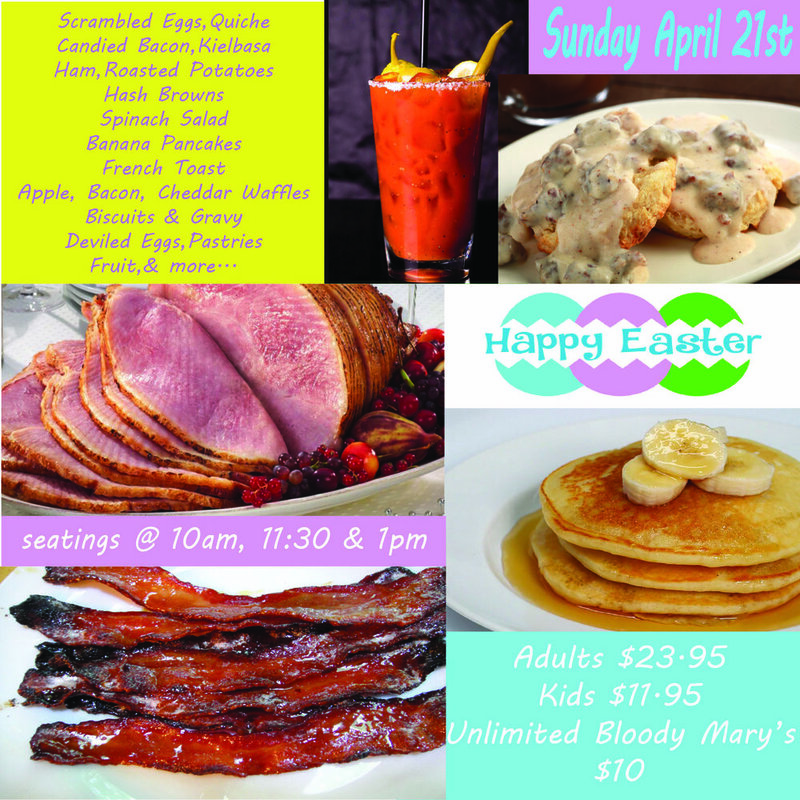 Call for additional Weekend Specials!!!! 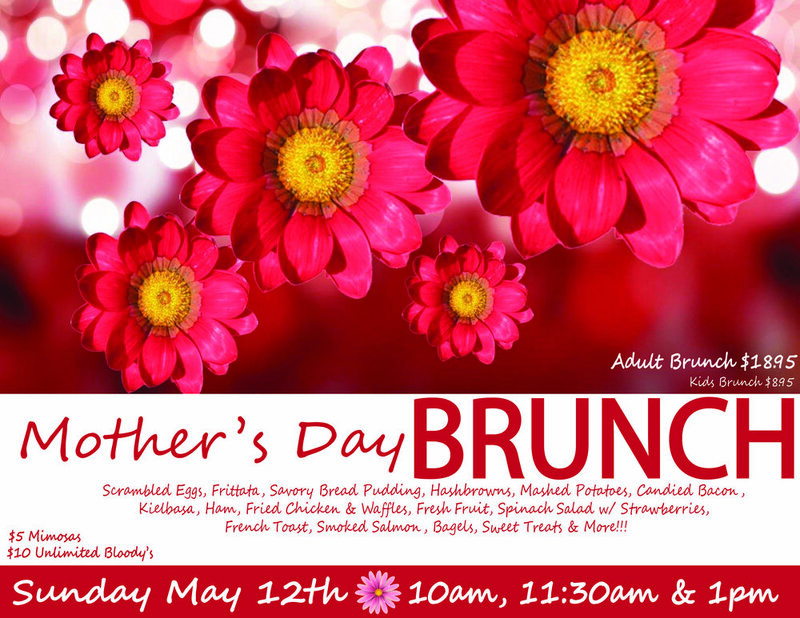 Join us for Mother’s Day Brunch!!! Buzzed Spelling Bee the 1st Thursday of every Month!! !